This characteristic 320 m2 farmhouse is placed on two levels. 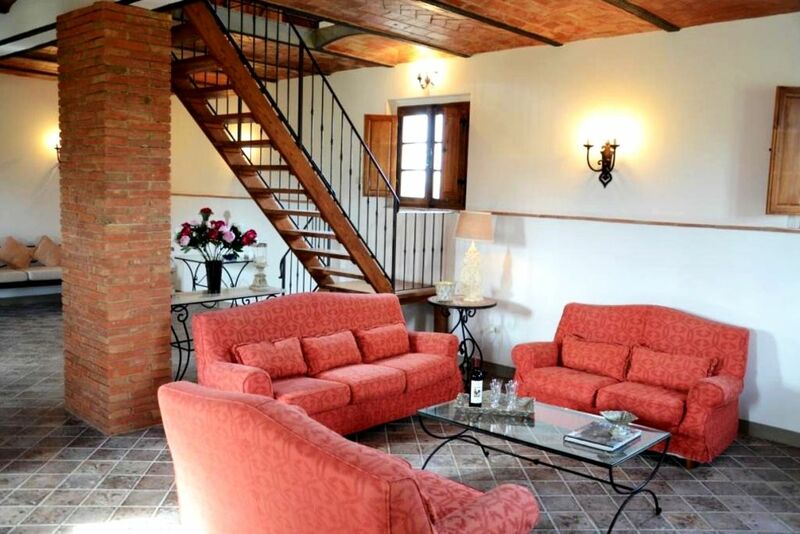 The farmhouse has a spacious living room with access to a beautiful terrace. This furnished outdoor terrace is a perfect place for outdoor dining and relaxing. The farmhouse sleeps 12 in 4 double rooms, 1 twin room plus 2 extra single beds. On the ground level, there is a double room with fly screens, and a full bathroom accessible from both the bedroom and the living room. There is also a laundry on the ground floor. Stairs lead to the first floor with an open dining/ kitchen with high ceilings, wooden beams, original terracotta floors and open fireplace. To the Right there is a door separating the sleeping area:2 bedrooms with screens on the windows and 1 bathroom between them with tub/shower. To the Left, another door with a further 2 bedrooms with fly screens and bathroom with shower. The house is equipped with Tuscan country furnishings typical for a farmhouse. The old furniture makes the place comfortable and charming, respecting the ancient rural Sienese traditions. You need a car in this area and ther eis plenty of parking at the villa. You can go to Florence for the day or Siena and also visit the Tuscan coast. There is no photo of the pool and there is a reason for this - the pool is only partly built-in, so on one side there is a rough patio, whereas on the other, there is a huge step-ladder to access it. We were also told that we had to clean it ourselves, something we have never done before. The house itself is huge, with a an enormous living/dining area on the ground floor. The kitchen is on the first floor, but the staircase is open-tread, and we didn't fancy carrying food up and down stairs which meant we couldn't eat outside. In general, we felt that much of the equipment felt like somebody's cast-offs, that the owners had taken the view that it would do for the holiday home. So the towels were thin, the sheets darned and the kitchen equipment was often lacking. Cupboards looked like they could do with a good clear-out too. However, we were provided with pool towels (it would have been great if we'd known this to save us carrying them!) and the outdoor terrace is very pleasant. The area is absolutely amazing, only kms from some of the most beautiful towns of Tuscany. Montalcino, Montepulciano, Bagno Vignoni , Pienza , San Quirico are all a short drive away as many other smaller little villages . Sweeping views , the area offers many walking trails , horse riding, wine tastings, incredible gastronomical experiences . Shops with typical items. There are supermarkets as well as little butchers and local shops.